This CC (constant current) and CV (constant voltage) welder delivers up to 400 amps of operation for one man, or simultaneous two man operation with 200 amps of output per person. As a generator it provides up to 14kW of 120/240 volt AC power. A digital dispay provides amperage and voltage information to the operator. In E-mode the unit can weld at idle speed to optimize fuel economy. 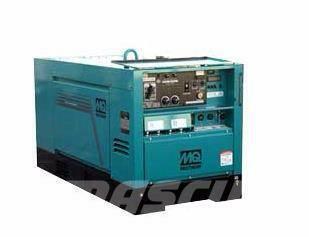 Additionally, this unit can be simultaneously used as a welder and generator. Low noise levels of only 67.5dBA.